You are at:Start Reading»Toddler»Education»Back To ABC…Teach Your Toddler! 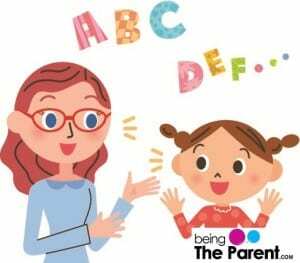 Back To ABC…Teach Your Toddler! Teaching toddlers!! Well, kids do have impressionable minds and all that has been said about grasping is true as well, but teaching alphabets to toddlers is a different ball game altogether. Not to forget teaching anything to toddlers is a challenge in itself. Most children recognize letters between the ages 2 and 5 – graduating from some of them between 2 and 3 to most of them between 4 and 5. So, you can start teaching your child when he’s nearly 2. Each toddler picks up and learns differently – don’t expect them to get mastered at it at once. There will be roadblocks and unsuccessful days and weeks, making you wonder if you’re on the right track and preparing your young one well enough to read and write. The first step towards teaching alphabets is to get your child interested in listening to stories and introducing colourful ABC books. He will enjoy seeing and pointing what he recognizes like colours, letters, animals and shapes in the book. To spark your toddlers interest in alphabets, engage him in activities in a fun and playful way so as he doesn’t realise that you’re grooming and teaching him for kindergarten. Showing him the fun side about stories, songs, books, and rhymes is most important. After reading a story ask your toddler about it, his favourite character, which part of story he liked the most and the like. When you are out and about, point out words on sign boards and hoardings which he might recognise. The most important word to start with is your child’s name. You need to show him how to identify his name, put the alphabets of his name together on an artwork and colour them to attract him and hang in his room or somewhere making it visible. You can buy magnetic alphabets and place them on the fridge so that he can play around with them and learn. When you tell your toddler about letters, emphasize on the sounds, as he will be taught to know the sounds of letter when he starts school. This is known as phonics, i.e. the sound of letter A is Aaa or Ah, B is Ba. The first step of phonics is to know the sounds. Make your own alphabet book with your toddler, on a blank paper book – cut out letters from old books and make them colourful and attractive. Ask your toddler to join in to sing the ABC songs together or you can sing nursery rhymes with dance and action. Your toddler can learn while he eats, make alphabet cookies by using letter cookie cutter with some icing on it, while baking ask questions like what letter does his name starts with? Now-a-days the traditional old French fries do come in variety of shapes, letters, numbers you can get those and fry at home. Remember one thing do not push your toddler to learn if he doesn’t seem interested, let it go and try some other time. Infact, there is no co-relation between early introduction of letters and advanced learning skills.